The low-profile, shingle-over design blends in with the hip of the roof allowing the vent to appear almost invisible from the ground. It provides exhaust along the roof’s hip allowing maximum airflow and uniform air movement throughout the attic space and its uni-directional construction allows for easy installation. The shingle-over hip vent designed for non-traditional ridgelines. Exceptional airflow. An external wind baffle directs airflow up and over the vent creating an area of low air pressure over the vent openings, pulling air out of the attic. Hip Ridge Vent provides 12 square inches of Net Free Area per linear foot. Advanced weather protection. Designed with an integrated rain diverter to channel water away from vent, an internal weather filter to protect from weather infiltration and an external wind baffle that deflects rain and snow over the vent. 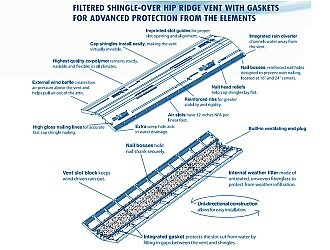 Hip Ridge Vent delivers superior weather protection in all climates. Easy Installation. Hip Ridge Vent’s uni-directional construction allows for easy installation. The vent includes time-saving features such as imprinted slot guides for proper slot opening and alignment, reinforced nail holes designed to prevent over-nailing and high gloss nail lines for accurate shingle nailing. Limited Lifetime Warranty and 5-year Replacement Plus™ Protection. Provides peace of mind for the homeowner and installer. Air Vent’s shingle-over Hip Ridge Vent gives roofing professionals another option besides power fans for today’s increasingly cut-up, non-traditional ridgelines. Here are examples of successful projects. “We installed the Hip Ridge Vent for a homeowner in Aurora. We completed the work quickly and without any problems. The product works great and it really adds a lot of aesthetic detail to the home. The product has an upfront cost, however, once installed there is no future cost or maintenance like some other forms of attic ventilation. This product is going to be a staple for our company from here on out.” – Bill Lonjac, Installer for Cleveland Remodelers, Inc.
“The roof installation using Hip Ridge Vent has survived its first winter and spring rains without reports of water infiltration. The original 6,000 square foot roof only had 6 static mushroom vents and most of the existing soffit vents were clogged with debris.” – Joseph Territo, Senior Associate/Forensic Architect, ENVIRON Corp.
Editor’s Note: This combination recreational and administration building complex experienced damaged sheathing and fascia boards in part from severely unbalanced attic ventilation. With the use of Hip Ridge Vent and continuous soffit venting the building now enjoys a balanced attic ventilation system. That has helped to increase the thermal performance of the facility and reduce maintenance costs. Editor’s Note: Shortly after the roof was finished Pete reported that very high winds accompanied by torrential rainfall hit the area several times over a 3 to 4-day period. No leaks. Furthermore, the homeowner has reported improved room temperatures on hot, sunny days. La Loma Roofing used ShingleVent II ridge vent on the horizontal ridges and installed 8″ x 16″ rectangular undereaves to balance the exhaust with intake airflow. Editor’s Note: This project includes Hip Ridge Vent (exhaust), ShingleVent II ridge vent (exhaust) and Pro Flow Vented Drip Edge (intake). Editor’s Note: In the photos that is NOT a roof-louver but a bath fan. Get a quick understanding of the step-by-step process of installing the Hip Ridge Vent on the diagonal hips of roofs. VIEWER ALERT: Keep an eye out for the non-continuous slot cuts required. 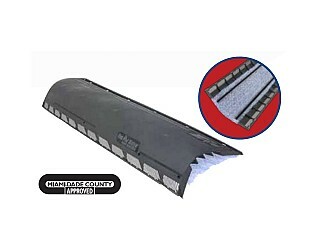 Check out the ONLY diagonally installed ridge vent on the market that passed Miami-Dade County’s tough wind-driven rain test with winds up to 110 MPH. Q: What is the Net Free vent Area of your Hip Ridge Vent? Why? A: The Net Free Area is 12 square inches per linear foot (NFA). The reduction of Net Free Area from ShingleVent II and VenturiVent Plus results from both a lower profile and the integrated gasket protruding into the venting pathway. Q: How many pieces of Hip Ridge Vent are in a carton? A: Ten pieces come in one carton of Hip Ridge Vent. Q: In what colors is Hip Ridge Vent available? A: Black is the only color available at this time. Q: What roof pitch can I use Hip Ridge Vent? A: The Hip Ridge Vent can be used on roof pitches 3/12 and greater. Q: How wide of a building can I use Hip Ridge Vent? A: The Hip Ridge Vent should never be used on buildings with an overall width (eave to eave measured horizontally) greater than 50 feet. The net free area (12″) will drop below the 1/300 ventilation requirement of building codes when widths exceed 50 feet. Greater building widths may be accommodated by using the Hip Ridge Vent in conjunction with ShingleVent II on all available peak (horizontal) ridges on the same structure. Please refer to the online calculator to verify prior to construction. Q: What length is Hip Ridge Vent? A: Each injection molded piece is four feet long. Please refer to the specification drawing for additional details. Q: Is the slot width for Hip Ridge Vent different from ShingleVent II? How do I know where the slot should be cut? A: The slot WIDTH is identical to ShingleVent II. There are pre-marked lines at the top of the vent to guide you with marking the roof deck appropriately based on truss or ridge pole construction styles. For reference, they are set apart at a 1½″ width for truss construction and 3″ width for ridge pole construction. Please review installation instructions before use. For slot length and roof locations, please refer to the Hip Ridge Vent installation sheet for details. The slot length is shorter than the nominal length of the vent to provide roof decking strength and weather protection between butted sections of Hip Ridge Vent. Q: When calculating the amount of Net Free Area needed using Hip Ridge Vent how do I account for the staggered slot perhaps reducing the vent’s Net Free Area? A: If the slot is properly cut in width and length according the installation instructions you will not reduce the vent’s Net Free Area. The only case in which a staggered slot can reduce the Net Free Area is when the remainder slot to be cut at the junction of the hip ridge and peak ridge cannot be done due to the necessary 12″ of solid deck from the peak ridge to the hip ridge slot and the 8″ of solid deck from any joint overlaps. Q: Why is it necessary to stagger the slot? And why are the staggered slots of different lengths? A: It is necessary to stagger the slots in different lengths to maintain the structural integrity of the roof deck. Q: Should I connect Hip Ridge Vent to the horizontally-positioned ridge vent or separate them? If it is recommended to connect them how do I connect them? A: Connect the two ridge vents. Miter cutting the Hip Ridge Vent using tin snips or a utility knife is the recommended method. The step-by-step process is detailed in the installation instructions. Q: Can I use either ShingleVent II or VenturiVent Plus ridge vents (which are higher profile ridge vents) AND the Hip Ridge Vent (which is a lower profile ridge vent) on the same horizontal ridge? If so, is there a trick to blending two ridge vents that have different profiles? A: This is not a recommended application. Q: If I choose (or my customer chooses) not to run the Hip Ridge Vent all the way down the entire diagonal length (the entire hip) how do you recommend I terminate the product? I realize the product has “built-in” end plugs on the ends of each 4-foot stick but what if I (or my customer) do not want that end of the product visible? 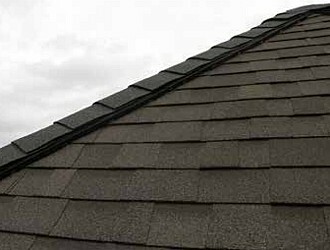 Is there a way to “cut the guts” out of the underside of the Hip Ridge Vent leaving only the top of the product for the last one foot so I can make a clean, sloped transition with my cap shingles? A: Transitioning or blending should be done by a roofing contractor based on the architectural style of the roof. Cutting out or removing the internal support of the Hip Ridge Vent (the underside of the vent) is not recommended. Q: How do I determine how much Hip Ridge Vent I need for a project? A: Determine the amount of intake and exhaust volume using the online calculator at www.airvent.com. You can do this manually by finding out the attic square footage and dividing by 150. Then divide this number in half to determine appropriate exhaust volume. Next, deduct the peak ridge net free area (NFA) from overall exhaust area required to determine overall area required on hip ridges. Divide this by 48 to determine total amount of four foot units needed and then divide the number of four foot units required by the number of hips to evenly distribute the exhaust area for optimum performance. Q: What is the warranty coverage for the Hip Ridge Vent? A: It is identical to ShingleVent II and The Edge Vent: Lifetime limited warranty and a 5-year Replacement Plus™ Protection. Q: Has the Hip Ridge Vent been tested? A: The Hip Ridge Vent is a brand new product to the marketplace from Air Vent, Inc. We are currently in the process of performing testing (internally and externally) for compliance with external code body agencies. As of now, we have completed the ASTM E330 wind uplift test for certification with the Texas Department of Insurance. There have also been extensive plastics tests done to the product to ensure longevity in the field under adverse sunlight and moisture-rich conditions. These include the ASTM G155 test which subjects the plastic of the vent to a 4500-hour long exposure to a Xenon Arc bulb to simulate a 5-year period of outdoor exposure to sunlight and must then be subjected to an ASTM D 638 tensile test to ensure no breakdown in the plastic material. The results of these tests showed an acceptable amount of change between the sample material and the control material. Q: What length and type of nail should I use with the Hip Ridge Vent? Can a nail gun be used? A: As long as the nail fully penetrates the roof deck any variety of standard roofing nail will work. A nail gun can be used as long as the installer checks the nail gun pressure to ensure the nails are not over-driven or under-driven. Over-driven nails could dimple or distort the cap shingles on the vent. Under-driven nails could contribute to the ridge vent backing out of the deck and lifting. This could lead to blow-off and/or wind/weather infiltration under the lifted vent. Additionally, under-driven nails could cause the cap shingles to blow off. Q: Do I need to install an end cap with the Hip Ridge Vent? A: The Hip Ridge Vent has integrated ventilated end caps at both ends of each 4’ piece. There is no need for any type of foam to be applied to the ends of the vent to create a finished look. Q: If the Hip Ridge Vent is installed on multiple diagonals (hips) of a common roof will the vent ingest air or short-circuit? A: The Hip Ridge Vent can be exposed to wind in ways that peak (horizontally positioned) ridge vents are not, in that the wind will not simply be blowing across the vent but also on top of the vent. With this taking place, positive (high) air pressure generated can cause air to go into vents that face the wind and exit vents that do not face the wind. Air Vent has designed the Hip Ridge Vent with weather protection features to reduce the possibility of weather infiltration should wind pressure allow air to enter the vent. While “hip style” ridge vents can ingest air in certain wind conditions testing with our University partners showed that our current product design protected the roof assembly. Q: Can the Hip Ridge Vent be installed with plank style decking? Air Vent does not recommend the Hip Vent with plank style decking. Once the planks are cut, there is no horizontal support on the hip ridge, so it will flex and weaken terribly. Any attempts at supporting it will likely block the area of the slot for air to flow, rendering the vent ineffective from that standpoint. Perhaps for this home a power fan would most likely be a better option as the decking can be supported between the joists where the hole is cut to ensure the cut planks can support weight.